This commonsense guide lets you develop your brand with the same techniques and technologies as the big players—but without all the cost. You’ll learn to master the same three-step plan the big advertisers use and discover the secret to brand continuity from product to product. This valuable resource will help you connect your products with your customers, no matter how small your brand. Branding is something you probably only think of in terms of household names and huge conglomerates. But branding isn't just for the big boys; smart branding is smart business for almost any company, no matter its size. In Think Two Products Ahead, ad agency insider Ben Mack reveals all the branding secrets the pros keep to themselves so you can put branding to work in your business, large or small. First, Mack destroys the myth that branding is your logo or your color palette. Then, he demonstrates how great branding works, so you won't waste your money on marketing that gets you nowhere. You'll learn a practical, commonsense approach to marketing that empowers you to develop your own brand with the same techniques and technologies the big players usebut without breaking the bank. In fact, the less you spend on marketing the more important these tools are to your success. You'll discover tools to give you a competitive advantage as you strengthen the relationship between your customer and your products or services. Every encounter with your customer will deepen this bond, leading to even greater future sales. Great branding isn't just about the product you're selling now, but about maintaining the sales momentum into the product you'll be selling tomorrow. Think Two Products Ahead shows you how to align your business plan with your marketing plan, so you can keep customers indefinitely. Using real examples from some of the most legendary (or disastrous) branding campaigns in history, Mack gives you an insider's perspectiveand inside adviceon which tactics will float your brand and which will sink it. He sorts the bad advice from the good, letting you avoid those missteps that get good companies in bad trouble. Branding isn't magic. 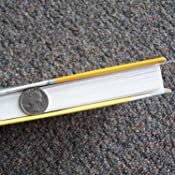 Not since Jay Levinson's original Guerrilla Marketing book has an insider really spilled the beans and taught you how to use the professional grade tools that are so simple they work automatically. 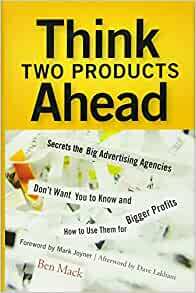 Think Two Products Ahead reveals inside secrets that make branding work for marketing budgets of any sizeso you can grow your business faster and stronger than you imagined. When it comes to your brand, this insider's guide proves that if you aren't thinking two products ahead, you're hardly thinking at all. "Mack will teach you how to turn every first sale into residual streams of income with products and services that literally compel a second, third, and fourth purchase. If you have a millionaire mind, you've just chosen to buy this book." "Creating loyalty beyond reason and moving from irreplaceable to irresistible is job #1 for all marketers today. Mack's book will help you get there." "I call Mack whenever I have a question about branding and he makes everything clear and even easy and obvious. 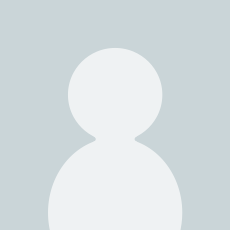 Think Two Products Ahead is like talking with Mack because every chapter gives you newfound clarity and you see how easy and profitable branding really should be." "For a guy like me who used to absolutely, positively hate branding, this book is a revelation. Finally, a clear-cut confessional from someone who has actually worked in the deep carpets with the guys and guyettes in the designer suits. But Mack generously goes beyond the Wizard of Oz exposé (that takes down the scam Madison Avenue and its provincial cousins have been running on businesses for years) and tells you what's good about branding, and how you can cash in on it for your business. I mean exactly, step by step. If you are in business and you have anything to do with marketing, you need this book." My biggest take-way from Ben's book is that creativity can be facilitated in the right environment. You can think more or less effectively about a problem, and there's a good framework here to be more effective. A good read and recommended if you're in any product or service based business. There's a fair amount of interesting, fundamental marketing information in here. Unfortunately, the entire book reads like ad copy. It's frequently a bunch of short, choppy sentences strung together without any flow, or clear organization. I found myself wondering if he just dictated the book, and transcribed it without much editing. Bens book will help you write your plan just as it should be done. It is almost the cookie cuter recipe for your success, just fill in the blanks and do the work. Ben did a great job of laying out your plan. The time consuming task for you is to actually do the work and fill it out. Yes it is easy to just look at what was written and try to get most of it down. To do a real marketing plan takes some time to do. The alternative is to pay someone instead. The more real that you can be the more this book will help you. I truly love this book. It gives a great overview of marketing and advertising that you can use to effectively craft your own marketing materials and efforts. Ben Mack writes in a somewhat crazy style that I like, throwing in lots of information that is tangential to the discussion to drive a point home. Read this is you are in business or marketing. I don't think Ben's style of writing is for everybody, but there is gold in there if you look for it. There are some good things in here. I like Ben Mack's ideas on his Legend Platform, the idea of "Customer as Hero," and his definition of waht he calls "Brand Essence." Those are some good takeaways. Mostly, I salute the author for his chutzpah. This book started as an e-book and has a real renegade, FU feel to it. It's ragged at points, but he fully admits that he's throwing a lot of you know what against the wall. 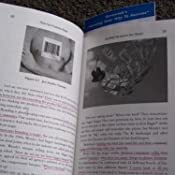 There have already been some thorough reviews regarding the awesome content of "Think Two Products Ahead", so I'll comment on the other stimulating aspect of Ben's book: Ben Mack injects several heaping table spoons of his unique and intriguing personality into every page. It's one thing to know more than anyone else about something, but to also be able to write about it, in a way that reaches out and grabs the reader by the shoulders, pulling them in closer and closer...now that's the trick. Ben Mack has mastered engaging the reader. Way to go Ben! If you've never tried to sell anything then this book is a must read. In a nut shell, the message is to think beyond and deeper than your product or your ego. The point that is continuously made is that your product is more than it may seem. What it is, what it does, its benefits, how its packaged, how you sell it, the words you use to sell it, its color etc etc, all play a part in how successful your marketing effort will be. In short think deep and multi layered. Like Jay Conrad Levinson changed small business marketing with Guerrilla Marketing, Ben Mack has leveled the playing field for small business branding. Mack makes branding usable, doable and profitable for small business owners. An expert storyteller and former ad agency brand strategist, Mack tells the stories of large corporations branding themselves with ad agency help. As a bonus, Mack provides step-by-step exercises for the small business owner to develop and refine their brand for their company. The stories and examples alone make entertaining reading, but the exercises makes this book a must for small business owners. *Trust builds loyalty and passionate loyal customers. Isn't this what every owner wants for their business? Warning: This is not an academic textbook. The exercises at the end of each section will, if you do them, give you a clear, usable and ultimately profitable brand. 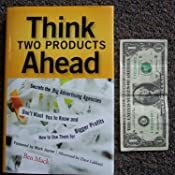 If you are willing to take a blank notebook, some reading and thinking time; Ben Mack in Think Two Products Ahead will guide you through the steps to develop a consistent, enjoyable and, yes, a profitable brand.